Click photo to download. Caption: Kevin Goodman of Cleveland, pictured, a Jewish runner in Monday's Boston Marathon, was in a hotel when the bombs went off. Credit: Courtesy of Kevin Goodman. Kevin Goodman’s second Boston Marathon will be one he will never forget. That’s because just about 60 minutes after he concluded the race, two explosions rocked the finish line. “It’s a gruesome day,” Goodman, who lives in Cleveland, told the Cleveland Jewish News from the Fairmont Copley Hotel, where he was staying in Boston. Goodman said he knew it was not a gas-line rupture as had first been reported. His room was on the fifth floor of the hotel. Goodman said plenty of medical people were on hand because of the thousands of runners who participate in the marathon. Click photo to download. 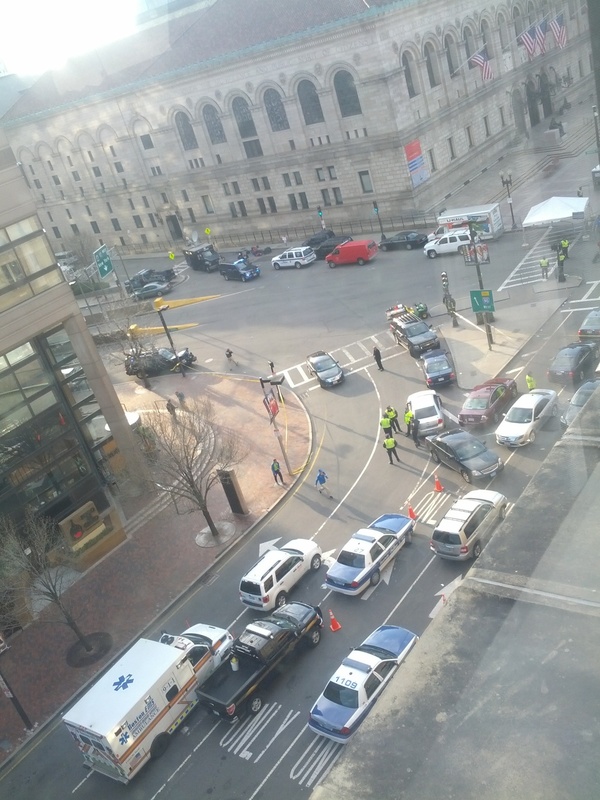 Caption: The scene from the fifth floor of the Fairmont Copley Plaza in Boston following Monday's Boston Marathon bombings. Credit: Courtesy of Kevin Goodman. “Fortunately, medical people were here for the race. People were covered in blood,” he said. “Runners were being used to immobilize the spectators (who were injured).” Runners helped provide medical treatment. Goodman, 50, immediately called his wife, Tracy. “I talked to her right when the explosions hit and told her I was going outside to help,” he said. This is not Goodman’s first brush with tragedy. He was in a commuter and freight train collision when he was 18 in 1981 in Prides Crossing in Beverly, Mass., about 30 minutes from Boston, when he was visiting his sister. He was uninjured. Goodman, who finished in 3:03.14, arrived in Boston on Saturday afternoon and returned April 16 to Cleveland. Goodman, who competed in his first Boston Marathon last year in 90-degree heat and finished in more than four hours, competes for Team in Training and raised money for the Leukemia and Lymphoma Society. The Goodmans’ two children, Joshua, 15, and Daniel, 10, are students in the Cleveland Heights-University School District. While the aftermath of the terrorist attack continues to unfold, Jewish leaders in Boston and Israel have expressed shock and sympathy for the victims. Israeli Prime Minister Benjamin Netanyahu, who has connections to Boston from his days as a student at the Massachusetts Institute of Technology and Harvard University, sent his condolences to President Barack Obama and the American people after the Boston Marathon attack. “A day of joy became a day of terror, I send my condolences to President Barack Obama, the American people and the bereaved families. Today, like everyday, Israel stands shoulder to shoulder with the American people,” Netanyahu said at an event at the President’s Residence in Israel, Ynet reported. Israel’s top diplomat to Boston, Consul-General Shai Bazak, said he was shocked that such an attack could occur in a peaceful city like Boston. As the investigation continues into who was behind the attack, the Boston JCRC’s Burton told JNS.org that the Boston Jewish community hasn’t taken any additional steps to protect its members and institutions beyond normal security protocols. “The network of Jewish agencies in Boston have been advised to check their security protocols. But there has been no communication from security officials here to suggest that there are any specific threats against the Boston Jewish community,” Burton said. A doctor who dealt with the aftermath of Monday’s Boston Marathon bombings credited Israeli expertise with his team’s ability to respond to a terrorist attack that killed three people and injured more than 100. “About two years ago in actual fact we asked the Israelis to come across and they helped us set up our disaster team so that we could respond in this kind of manner,” said Alasdair Conn, Chief of Emergency Services at Massachusetts General Hospital, the Algemeiner reported. Conn, asked if he would characterize the Boston Marathon blasts as “almost something you would see in a military setting,” said the attack reminded him of something that would happen in Israel, whose citizens have been long accustomed to terrorist suicide bombings. “Oh absolutely, absolutely this is like a bomb explosion that we hear about in the news in Baghdad, or Israel or some other tragic place in the world,” Conn said. eady warned Jewish groups to be on alert this week due to the anniversary of the Oklahoma City bombing and Adolph Hitler’s birthday. “This apparent terrorist attack comes during a week when we are already on heightened alert because of the history of extremist-related events that have taken place during the week of April 20th, including the (April 19, 1995) Oklahoma City bombing and the federal raid of the Branch Davidian Compound in Waco, Texas,” ADL National Director Abraham Foxman said in a statement. Due to Hitler’s birthday of April 20, ADL had “issued a security alert to Jewish community institutions reminding them to be on high alert during this time of year,” Foxman said. Posted on April 16, 2013 by JNS.org and filed under News, U.S. and tagged Boston Marathon bombings.